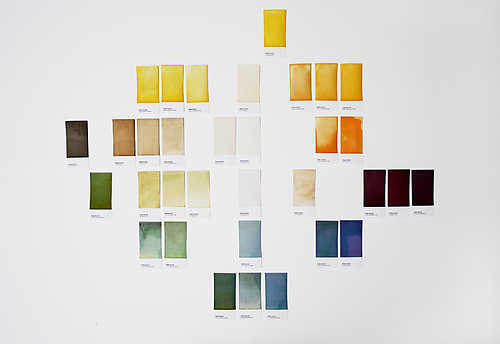 Daniera ter Haar and Christoph Brach together created 100%SAP, a project about the power of natural color. Vegetables are transformed to a natural ink to feed a new printing process. 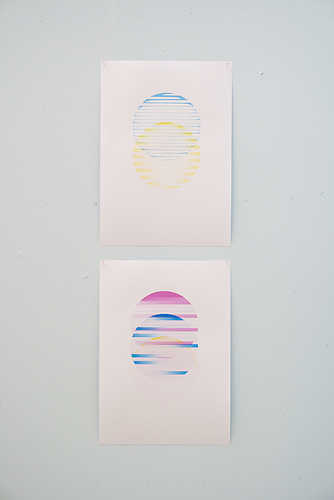 This process enables the viewer to watch the poster’s print slightly grow. A 3-D ingredient returns as 2-D icon. 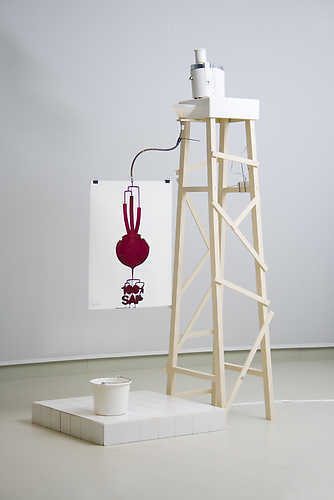 For Platform21 = Cooking and Constructing, Ter Haar and Brach used the kitchen unit setting of Platform21 as their temporary studio to continue their experiment with natural ink. 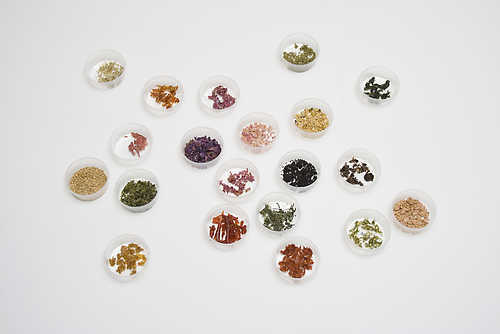 It became a visual research about vegetables and their powerful colours, which they named RAW COLOR. Vegetables are dismantled and purified to their visual essence, their raw colour. 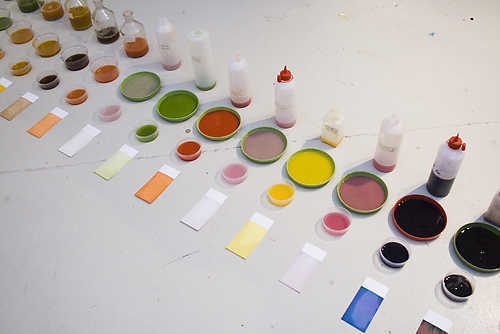 A new process preserving their intensity on colour cards captures the harvested colour. Categorized by shades and families, a new map is created which shows their beautiful diversity. Ter Haar and Brach also started looking for applications for their ink, filling the cartridges of an inkjet printer with colors closely matching standard printing colors. Cyan is replaced by the ink from red cabbage, yellow by pumpkin and magenta by beetroot. They started with printing abstract forms like blocks and circles. Soon they found out that the circles did not come out full but consisted instead of a collection of stripes originated by the thickness of the ink, which silted up the print head quickly. Approaching this project with the printing process in mind, Ter Haar and Brach also found a new use for the leftover vegetable pulp which had been processed in the juicer. By drying the pulp in an oven the natural colour and pulp itself last much longer. Pulverizing the pulp for storage and making it into ink again by diluting with alcohol and water are the next step in this process which Brach and Ter Haar will continue researching on. What effect do your eating habits have on your environment? Use grain and corn for food or for fuel? Presentations on a fuel station for car and mind, art with a conscience, lemon batteries and a VJ performance reporting live on all this. What can you repair at Platform21?